The accumulation of demerit points will lead to a licence suspension depending upon the class of licence. any accumulation of six (6) or more demerit points. a violation of the G1 or G2 licence conditions. The suspension will be for thirty days for the first accumulation, any further accumulations will be for minimum of 90 days. Class G licence holders may accumulate eight (8) demerit points without issue. Upon accumulating nine (9) demerit points the driver will receive a notice from the Ministry of Transport. The Ministry will require them to attend at their offices to explain why they have received the demerit points and why the driver should not have their drivers licence suspended. Upon accumulating fifteen (15) demerit points, drivers will receive an automatic thirty day driver’s licence suspension. After the thirty day suspension, the drivers demerit point accumulation will be reduced. Subsequent accumulations of fifteen (15) demerit points will result in a drivers licence suspension of six months. 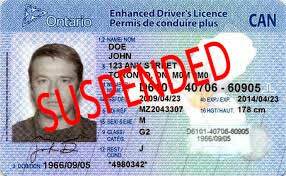 Suspensions for demerit points take affect from the date that the licence was received, or handed into the Ministry of Transportation. If you are caught driving under suspension as of demerit point accumulations, the police can charge you even if you did not receive notice of the suspension. Minimum one thousand (1000) dollar fine. When the driver has been convicted of an offence there maybe a possibility to appeal the conviction. An appeal would either fight the charge with the goal of having the charge dismissed or reducing the charge to save the demerits. There are rules for Appeals and we suggest you contact our office(s) to discuss your case. Demerit points appear on a driving record only upon conviction. Demerits stay on the abstract for two (2) years from the offence date. Through creative management of your traffic ticket many times time can be used to ensure that the licence does not go under suspension. John has 6 demerits on his licence. He now receives a speeding ticket with 3 points. The further 3 points if he were to pay the ticket will put him at 9 points and result in a 30 day licence suspension. John contacts OTT and discusses his problem. OTT reviews the case and explains to John how they will work to control the court date so that the first ticket and points age out and are expired by the time the third ticket comes to court. Thereby avoiding a demerit point suspension.